Nigel Lack, senior partner at Westminster Compliance, provides an overview of the Health and Safety obligations of tenants in commercial properties. •	How can SMEs meet their H&S obligations cost effectively. How McGrigors went about moving to brand new offices..................successfully, despite having to cope with the financial demise of some of their key suppliers. Anne Beitel is a managing director at Executives Online. She has more than 10 years experience marketing in high-growth environments. She played a crucial role in the company’s recent management buy out. Paul Lee is responsible for the Technology, Media and Telecommunications (TMT) sector within Deloitte Research, Deloitte’s dedicated thought leadership group. Paul has also completed his fourth book, “Convergence Conversations,” based on interviews with 36 of the world’s leading TMT executives. In this interview Paul discusses some of the issues you need to consider when bringing your print-based content online. Robert Hardie, Knowledge Centre Director at Knowledge Peers Plc, gives advice on acquiring a new or replacement property. In this audio podcast Peter Gillman is the Managing Director of Price Bailey, a £15m fee chartered accountancy practice that has already moved to Limited Liability Partnership structure. Here he looks at arrange of pros and cons, including unexpected ramifications. In this audio podcast Peter Gillman is the Managing Director of Price Bailey, a £15m fee chartered accountancy practice with an embedded sales culture. In this interview Peter explains his firm’s attitude and approach to sales. In this audio podcast Victoria Leigh, Partner with Hammonds LLP, talks about what she would advise clients to do to get the best from their lawyers. In this audio podcast Jouko Ahvenainen, Chairman of Grow VC, advises startups on how to get the most out of their advisors. In this audio podcast Geoff Eagland, proprietor of Rosslyn Associates and NED of several UK companies, talks about the issues that he has faced when using lawyers during corporate transactions and how he dealt with these issues. In this audio podcast Tessa Laws, Partner with Rosenblatt Solicitors, talks about what she would advise clients to do to get the most from their advisors. In this audio podcast Tessa Laws, Partner with Rosenblatt Solicitors, talks about business development approaches that her firm has found to be successful. In this audio podcast Ben Favaloro, Business Development manager with Smith & Williamson’s corporate tax unit, explains how the business the business development role works in an accountancy firm and what are the key activities that he undertakes. Frank Joshi, Director of MVine Ltd, talks about how he goes about getting the most from his advisors. In this audio podcast Richard Turner, Chief Executive of Clear Swift, talks about how he goes about getting the most out of his advisors. In this audio podcast Richard Turner, Chief Executive of Clear Swift, recently changed his audit firm from one of the Big 4 to Grant Thornton. He explains why and how he went about selecting his new auditors. Geert van der Elst is a director of Gelst and specialises in helping professional services firms increase their revenues. In this interview Geert explains the importance of win/loss reviews for professional services firms and advises on how to go about doing such reviews. Geert van der Elst is a director of Gelst and specialises in helping professional services firms increase their revenues. In this interview Geert advises partners who may be uncomfortable in a sales situation on how to conduct a sales meeting. 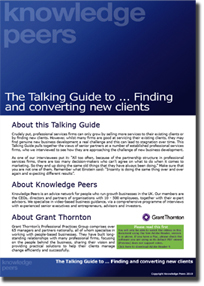 Peter Gamson, partner responsible for professional practices at Grant Thornton, talks about his approach to finding new clients. He also shares his observations about the successful business development activities adopted by his clients (all of whom are professional services firms). Geert van der Elst is a director of Gelst and specialises in helping professional services firms increase their revenues. In this interview Geert highlights the relevance of the marketing function to business development in a professional services firm and advises on how you can integrate and align your sales and marketing activities. Peter Gillman is the Managing Director of Price Bailey, a £15m fee chartered accountancy practice with an embedded sales culture. In this interview Peter explains his firm’s attitude and approach to sales. Geert van der Elst is a director of Gelst and specialises in helping professional services firms increase their revenues. In this interview Geert advises on how firms should go about generating new leads. Geoff Eagland, proprietor of Rosslyn Associates and NED of several UK companies, talks about the issues that he has faced when using lawyers during corporate transactions and how he dealt with these issues. Tessa Laws, Partner with Rosenblatt Solicitors, talks about business development approaches that her firm has found to be successful. Ben Favaloro, Business Development manager with Smith & Williamson’s corporate tax unit, explains how the business development role works in an accountancy firm and the key activities that he undertakes. Victoria Leigh, Partner with Hammonds LLP, talks about what she would advise clients to do to get the best from their lawyers. Tessa Laws, Partner with Rosenblatt Solicitors, talks about what she would advise clients to do to get the most from their advisors. Matthew Honey, who regularly engages corporate advisors, discusses how he goes about finding a new advisor. A professional image and good communication from the outset is key in terms of selection. Margaret Mannell, Director of Administration at Morrison & Foerster’s London office, talks about “BD Twitter”, an innovative and practical approach adopted by her firm for sharing of knowledge and intelligence between partners prior to meeting potential clients. Margaret Mannell, Director of Administration at Morrison & Foerster’s London office, talks about business development approaches that her firm has found to be successful. Mark Perl is the director The Guru Garage, a company dedicated to training professionals how to network in a confident and effective manner and how to follow up potential opportunities with a professional and positive approach. Mahendra Shah is principal accountant at Sherwoods Accountants, a chartered certified accountant providing auditing, accounting and tax services, as well as offering advice on how to improve and develop businesses. In this interview Mahendra discusses how Sherwoods is responding to the economic downturn by focusing on good customer service. Mark Perl is the director The Guru Garage, a company dedicated to training professionals in how to network in a confident and effective manner and how to follow up potential opportunities with a professional and positive approach. Mark Perl is the director The Guru Garage, a company dedicated to training professionals hot to network in a confident and effective manner and how to follow up potential opportunities with a professional and positive approach. In this interview Mark talks about The Guru Garage. Robert Hall, Managing Director of Sunrise Consulting, talks about the issues surrounding marketing for a small consultancy. ●	how to look for and identify new clients. Alysoun Stewart, Partner of Grant Thornton LLP, talks about the marketing and strategic challenges facing professional service firms. ●	how to develop a more commercial, market-facing approach. Matthew Honey, Director, Kinetic Helm Ltd.
Large or small, what's best? Changing auditors: Large or small, what's best? Peter Gillman is the Managing Director of Price Bailey, a £15m fee chartered accountancy practice that has already moved to Limited Liability Partnership structure. Here he looks at a range of pros and cons, including unexpected (but positive!) ramifications.Peter highlights the need to involve your bankers from an early stage. Alysoun Stewart, Partner of Grant Thornton LLP, talks about governance and reward issues concerning professional services firms. ●	a firm's profit distribution policy. Frank Jones, Chairman of ASAP UK Ltd, talks about how a firm can prepare for a downturn and how it can affect the mix of staff. ●	the implications of the mix of staff – permanent and contract. Robert Mowbray, a Partner with Taylor Mowbray LLP, explains how fee income and practice profitability can be maintained during a downturn. •	the potential for reducing other costs. Robert Mowbray, Principal of MacIntyre, talks about how to improve efficiency and profitability in legal practices. ●	how structure can affect profitability. Steve Pipe, Chairman of AVN, explains how accountancy firms can improve profitability through pro-activity. Peter Gamson, Audit Partner and Head of National Professional Practices Group, Grant Thornton, talks about risk management when taking on new clients. ●	the advantages of having a review committee. Peter Gamson, Audit Partner and Head of National Professional Practices Group, Grant Thornton, talks about risk management concerning claims. ●	how firms can ensure all claims have been handled. 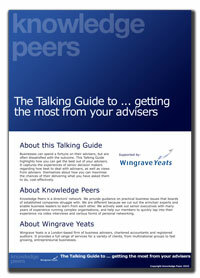 Robert Hardie, Knowledge Centre Director at Knowledge Peers Plc, gives advice regarding Services Charges. •	advice on retaining consultants. Professional services firms can only grow by selling more services to their existing clients or by finding new clients. However, whilst many firms are good at servicing their existing clients, they may find genuine new business development a real challenge and this can lead to stagnation over time. Mark Buffery, Chartered Accountant and VAT Practitioner, talks about VAT issues when raising funds. ●	how different types of finance can affect VAT. Mark Buffery, Chartered Accountant and VAT Practitioner, talks about reclaiming VAT on disbursements. ●	risks businesses run by failing to understand the VAT process. Mark Buffery, Chartered Accountant and VAT Practitioner, talks about the VAT issues concerning company acquisitions. ●	the VAT implications of buying a going concern. Mark Buffery, Chartered Accountant and VAT Practitioner, talks about VAT issues concerning property transactions. ●	the most common VAT pitfalls when dealing with property transactions. Jennifer Oldfield, MD of The Quartz Partnership (Bradbury Financial), talks about Working Capital Management in a legal practice. ●	the measures a firm can take to speed up cash collection. Piyali Williams, Head of Professional Propositions at HSBC Business Banking, talks about Working Capital Management from the bank's point of view. ●	the covenants the bank focuses on. Francis Thoday, Managing Director of Magnus Ltd, provides a case study of how he reduced his company’s overdue debts by over 90%.